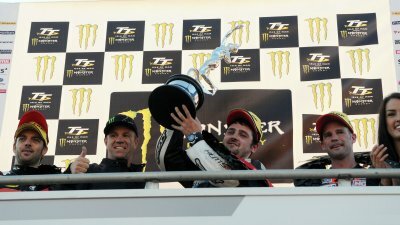 Entries have now closed for the 2013 Isle of Man TT Races, fuelled by Monster Energy, with a high quality field set to start the Dainese Superbike, Royal London 360° Superstock, Monster Energy Supersport and PokerStars Senior categories. All four classes were significantly over-subscribed, promising competitive and thrilling racing in June. A number of interesting entries, including new participants, have also been received for the SES TT Zero, with teams looking to emulate last year's historic 100mph laps by MotoCzysz and Mugen, while the Lightweight TT has attracted a greater number, and more varied entries than the inaugural race in 2012, with over 70 riders expected to start this year's race. The Sure Sidecar class has also seen the highest number of crews entered since the 2007 centenary TT meeting. Major manufacturers are supporting the event with officially entered teams include Yamaha, Honda, Suzuki, Kawasaki, BMW, Aprilia, Ducati, MV Agusta, Norton and the Chinese WK Bikes. All of the leading road racing teams have committed to the event, including Honda TT Legends, Padgetts Racing, Wilson Craig Racing, Tyco Suzuki, Milwaukee Yamaha, KMR Kawasaki, Valmoto, SMT Racing, Quattro Kawasaki, Ian Lougher Racing, CD Racing, PR Kawasaki, Penz13.Com BMW, Splitlath Redmond, Ice Valley by Motorsave, Team Rapido Sport Racing and Centurion Racing as well as a host of other established and up and coming teams. The solo entry is packed with high calibre riders including John McGuinness, Michael Dunlop, Guy Martin, Bruce Anstey, Cameron Donald, Conor Cummins, Gary Johnson, Michael Rutter, James Hillier, William Dunlop, Dan Kneen, Dan Stewart and Ian Lougher, who will be returning to the TT Races in 2013 with Steve Mercer, Ben Wylie, Russ Mountford and Ivan Lintin just some of leading privateers tackling the famous 37 and ¾ mile Mountain Course in June. Leading newcomers from recent years including Simon Andrews, David Johnson, Dean Harrison, Daniel Cooper, Jamie Hamilton, Karl Harris, Lee Johnston and Jimmy Storrar have all confirmed their affinity with the TT by returning while Manx Grand Prix riders Wayne Kirwan, Ryan Kneen and Jamie Coward will make their TT debuts this year, as will leading Irish road race specialist Derek Sheils. The list of solo newcomers has a particularly international feel this year with exciting new names for 2013 set to include Josh Brookes (Australia), AJ Venter (South Africa), Horst Saiger (Austria), Branko Srdanov (Netherlands), Petre Pop (Romania), Juha Kallio (Finland), Stephen Michaels (Germany), Rafael Paschoalin (Brazil), Gavin Hunt (Isle of Man), Jonathan Howarth and Daley Mathison (England) and Michael Pearson and Sam Wilson (Northern Ireland). In a historic occurrence, not only will China be represented by the Chinese manufactured WK machine in the Lightweight Race, ridden by Australian David Johnson, but there will also be rider representation with Cheung Wai On becoming the first Chinese rider to contest the TT Races, riding for the Splitlath Redmond team. The legendary Dave Molyneux, again with Patrick Farrance in the chair, will be looking to add to his record tally of 16 wins. Competition is again expected to come from reigning World Champion Tim Reeves and former World Champion Ben Birchall, the duo again partnered by Dan Sayle and Tom Birchall respectively. 2011 Race champions John Holden and Andy Winkle, who crashed heavily on a practice lap 12 months ago, are back as are Conrad Harrison and Mike Aylott. There is a superb tally of 13 newcomer drivers on this year's entry list including local man Darren Hope who tasted victory as a passenger with Nick Crowe in 2005 and 2006 who is now trying his hand as a driver. The Lightweight class, for the 650cc Supertwin machines, has again seen major interest with entries received, amongst others, from McGuinness, Rutter, Michael Dunlop, Hillier, Cummins, Donald and Johnson. 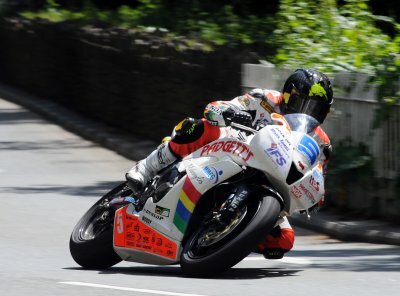 With the class offering more of a level playing field, the likes of Mountford, Cooper, Lintin, Wylie and Olie Linsdell should again feature prominently as should Chris Palmer, who makes his return to the TT after a three-year absence. “It is especially pleasing to see the commitment from all the leading teams and manufacturers, who clearly see the TT as a genuine global marketing platform for their sponsors. Meanwhile the interest from talented solo newcomers from around the world, and the mass influx of new sidecar crews, means that the TT’s sporting foundations are stronger than ever over 100 years on from the first running of this amazing event”.